In September 2010, the Northern California butchery, Fatted Calf, opened its second brick-and-mortar shop at 322 Fell Street--the Fell Street store frontage of the Linden building. When BUILD's co-founder, Loring Sagan, purchased and remodeled the Linden building, his vision was incubate a vibrant community of makers, artists, and visionaries in Hayes Valley. He designed the building to have traditional store frontage on Fell Street (the current Fatted Calf location) and untraditional frontage on Linden Alley. To activate the key intersection for our O&M project (at the corner of 19th and Indiana), BUILD included a 2,000-sf ground-level retail space that wraps the corner of the building and opens onto the adjacent Dogpatch Arts Plaza with floor-to-ceiling mobile glass walls. We then worked with the local Piccino restaurant to bring to life a new cafe called Noon All Day. The build-out of the cafe was coordinated with overall construction to open in late 2017 as we were leasing up the residential spaces. Immediately, the cafe has helped define the project, the plaza, and the overall feel of the area. Visitors enjoy both indoor and outdoor seating, bring activity to the Plaza, and build connections with the apartment buildings as they can see through into the interior courtyard of Building O. 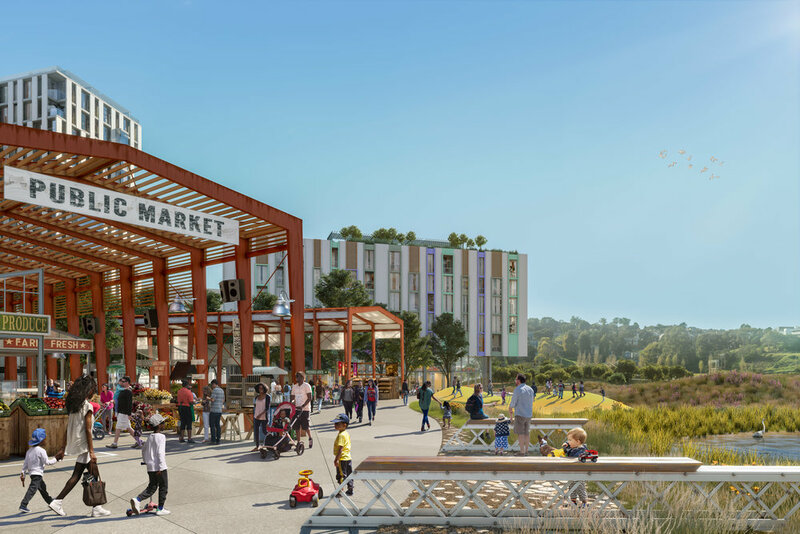 The new mixed-use village at India Basin has been founded around guiding principles that include "Complete the Neighborhood" and "Shape Public Space for Public Life". Critical to both of these elements is providing space for commerce. The Design Guidelines for the project encourage abundant street-level commercial activity throughout the site, particularly along New Hudson street and at the Aurelious Walker entrance, which will also be a major transit stop. The plans also call for a "Public Market" space at the heart of the village where the buildings open on to the Big Green. The goal is that the Public Market will serve as a major destination and gathering place. We envision flexible pavilions designed to be modular and evolve over time. They will provide seating, shade, community spaces, and stalls for local vendors and artisans. With this type of flexible, evolving space we hope to not only accomodate, but also incubate, local businesses. The One Oak project aims to enhance and activate this critical San Francisco intersection of two major thoroughfares: Market Street and Van Ness Avenue. 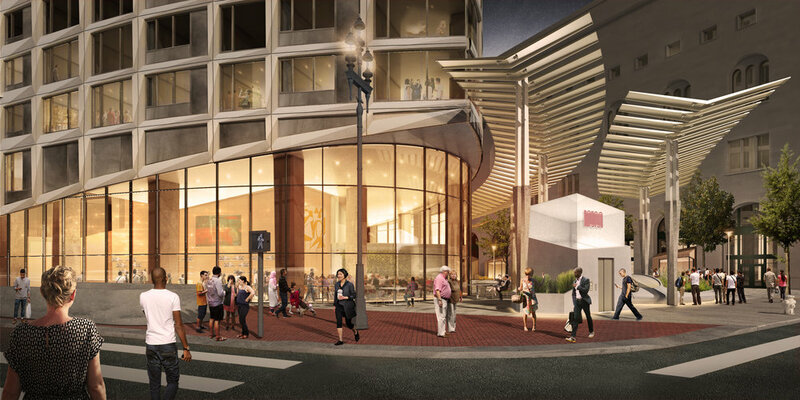 The street-level "prow" of the building has been designed as a 4,265-sf restaurant space with arcing glass facades onto 3 different streets, including adjacent One Oak Plaza. In addition, we have been working with Place Lab to explore the concept of retail kiosks incorporated into One Oak Plaza that would provide valuable, high-traffic spaces for small vendors and local stores. Principal Loring Sagan and wife Margherita created Piccino, also known as the “Yellow Building", in the heart of the Dogpatch, becoming an award winning restaurant and icon of the neighborhood.